When the first demonstrations took place in Tahrir Square I was thrilled that the people were able to demand Mubarak step down, because I love Cairo and have been there often for work and pleasure. As I watched the Arab Spring unfold I began to wonder if we, here at home, would ever take to the streets again, and we did. Would that the world could calm down in the new year. Things have taken a very violent turn in Cairo and other countries. Below you will find a link to an article and video that absolutely breaks my heart. The violence is beyond anything I've seen on the news. Enlarge the video to fill your screen so you can get a better look at what's happening. The whole world should be watching, so please have a good look and then write to our President (http://www.whitehouse.gov/contact), or yours, and ask that she or he join with other heads of state to put pressure on the Egyptian military to resume civility towards civil society. 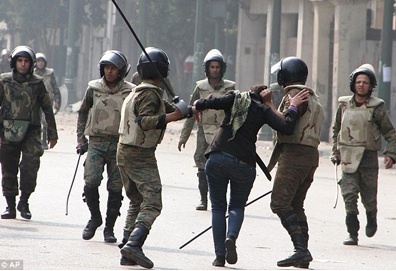 Even with all my years of demonstrating and activism, I am horrified at the level of pure viciousness and wild rage that these armed (with metal clubs) and dangerous military perpetrators unleashed on demonstrators, including women, in Tahrir Square. wrinkling, http://eneutrogena.com which is obtainable in a focused liquefied kind.